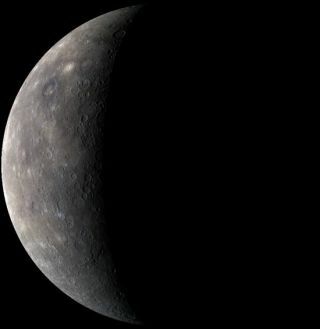 A MESSENGER color observation of Mercury obtained as the spacecraft approached the planet for its third and final flyby on 29 September 2009. A NASA spacecraft has spotted what appears to be changingseasons on Mercury and found much more iron on the surface of the small, rocky planetthan previously thought. The MESSENGERprobe made the observations during its thirdflyby of Mercury on Sept. 29, when it took a host of measurements andimages of the innermost planet's surface and atmosphere. Only about half of theplanned measurements were made because of a dataglitch that affected the spacecraft during the flyby. The $446 million probe's third flyby brought it within 142miles (228 km) of Mercury's surface to cover more uncharted terrain, leaving 98percent of the planet now mapped. The flyby was also a gravity assist meant toguide the spacecraft into orbit around the planet in 2011. Mercury's atmosphere is what scientists call an"exosphere," and is made up of atoms kicked up from the surface. Itis verytenuous and has a very low density, meaning atoms in the atmosphere rarelyrun into each other. It also has a tail that streams away from the planet inthe opposite direction of the sun. MESSENGER looked at differences in three atoms in theexosphere ? sodium, calcium and magnesium ? between the probe?s three flybys.They detected much less sodium during the third flyby than they had during thesecond. "While this is dramatic, it isn't totally unexpected,"Vervack said. This is because radiation pressures from the sun change asMercury moves through its orbit, which changes the amount of sodium liberatedfrom the surface. In essence, Mercury's atmosphere experiences seasonaleffects during the planet's orbit. Calcium and magnesium showed less variation between"seasons" than did sodium, showing that different atoms "aregoing to have their own unique seasonal varations," Vervack said. Understanding these seasonal differences will helpscientists understand how surface material is lost and how the surface haschanged over time. Mercury's atmosphere is "the end product of a fewbillion years of these processes, they never stop," said mission scientistRonald Vervack, Jr., of The Johns Hopkins University Applied Physics Laboratory(JHUAPL) in Laurel, Md. The MESSENGER flybys also provided the first directmeasurements of the amounts of certain elements on Mercury's surface. Mercury's surface has long thought to be deficient in theheavy metals iron and titanium on the basis of earlier observations, an ironicmake-up considering that its heavy iron core makes up an estimated 60 percentof the planet's mass and makes it the densest of the solar system's rockplanets. MESSENGER?s observations show that Mercury's surfaceactually possesses relatively high numbers of these elements ? similar to theconcentrations in the moon's nearside maria basalts ? which could mean thatmodels on the planet's formation and evolution will need to be revised. "That's a pretty exciting result for us," saidDavid Lawrence, also of JHUAPL. The third flyby also yielded new images of the surface thatfill in as-yet unobserved areas. The spacecraft?s cameras and instrumentscollected high-resolution and color images unveiling another 6 percent of theplanet?s surface never before seen at close range. "We've done a good job on filling in most of thatmap," said Brett Denevi, imaging team member and postdoctoral researcherat Arizona State University in Tempe. The flyby garnered images of a feature seen before, but notin enough detail to characterize it. It appears to be abright area surrounding an irregular depression, with steep sides and anodd shape, "all of which are hallmarks of something like a volcanicvent," Denevi said. Other images revealed a double-ring impact basinapproximately 180 miles across. The basin is similar to a feature scientistscall the Raditladi basin, which was viewed during the probe?s first flyby ofMercury in January 2008. "One similarity to Raditladi is its age, which has beenestimated to be approximately one billion years old. Such an age is quite youngfor an impact basin, because most basins are about four times older,"Denevi said. "The inner floor of this basin is even younger than the basinitself and differs in color from its surroundings. We may have found theyoungest volcanic material on Mercury." The spacecraft has completed nearly three-quarters of its4.9-billion-mile journey to enter orbit around Mercury. The full trip willinclude more than 15 trips around the sun. In addition to flying by Mercury,the spacecraft flew past Earth in August 2005 and Venus in October 2006 andJune 2007.